Helping Purdue's undergraduates understand the way education scholars obtain knowledge -- and helping them participate in the research process -- is one of Youli Mantzicopoulos-James' primary goals. A professor of educational psychology, Mantzicopoulos-James coordinates the College of Education's Undergraduate Research Training Program (URT). 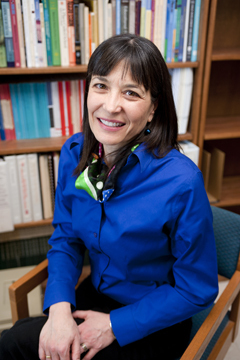 She helps students understand how to conduct research early in their academic careers while simultaneously making advances in her own research, which focuses on the ways learning contexts support young children’s social development and motivation. What is the Undergraduate Research Training Program? The URT program has been in existence at Purdue since the 1960s, and it is run through the Office of the Associate Dean of Research in the College of Education. Each year, the program pairs 10 to 12 undergraduates with professors in the college who are doing research related to education. For two semesters, the students help them as graduate assistants might. Undergraduates in the program do a wide variety of research-related tasks. For example, students do things such as helping faculty gather data, conduct educational and psychological assessments, analyze data and compile related reports. The program also involves an in-class component that consists of two courses -- one each semester -- that introduce the program's students to educational research, its techniques and how it contributes to our field. Both myself and colleagues in educational psychology teach these courses. What do students learn when they participate in the program? One of the reasons our program has been successful for so long is that it gives undergraduates an opportunity to learn about research methods not only through coursework, but also by participating in research programs that are headed by faculty who are experienced researchers. Our program allows students to get a feel for how scholars construct and revise knowledge in a particular area of study. In addition to participating in that process, which is very important to academia, our students can discover early on the value of conducting research, and they can consider pursuing research-related careers. In contrast, most students don't get a chance to be involved with research until they reach graduate school. For students whose career paths are practitioner-oriented, the program helps them become knowledgeable consumers of research. What are the requirements for students who are considered for acceptance into the program? Students must have a 3.0 GPA and be interested in educational research to qualify for acceptance. Each year, we solicit applications from eligible students, and then we pair students with one of 10 to 12 faculty research projects that have been approved for an URT. All URT research projects involve education in some way, but we give considerable weight to students’ interests as we pair them with specific projects. The students come from all over campus and not just from the College of Education. Right now I'm analyzing data from the Scientific Literacy Project that I recently finished with Ala Samarapungavan and Helen Patrick, who are my colleagues here at Purdue. Our study took place in local elementary classrooms; we developed a 20-week comprehensive program of science inquiry and literacy activities with both classroom and home components. We were interested in examining how young children learn and become interested in science. This is an exciting and important topic because there are very few science programs for young children, and there is very limited research to speak to the effectiveness of these programs. Our goal was to contribute to that body of knowledge. We have published a series of papers clearly documenting that meaningful participation in inquiry-oriented science experiences contributes to young children’s science learning. Importantly, our research also shows that children’s motivation for science is impacted in very positive ways as a result of participation in our program. Currently, Helen Patrick and I are working on a new project that examines observational measures of teacher effectiveness, a topic that is at the forefront of national and state agendas. We are comparing several different measures, including Indiana’s RISE. Findings from this work are expected to inform policies affecting teachers and educational programs.